Who Really Pays For Health Care Might Surprise You : Shots - Health News Government has been part of the business of medicine at least since the 1940s, when Washington began appropriating billions of dollars to build private and government hospitals. 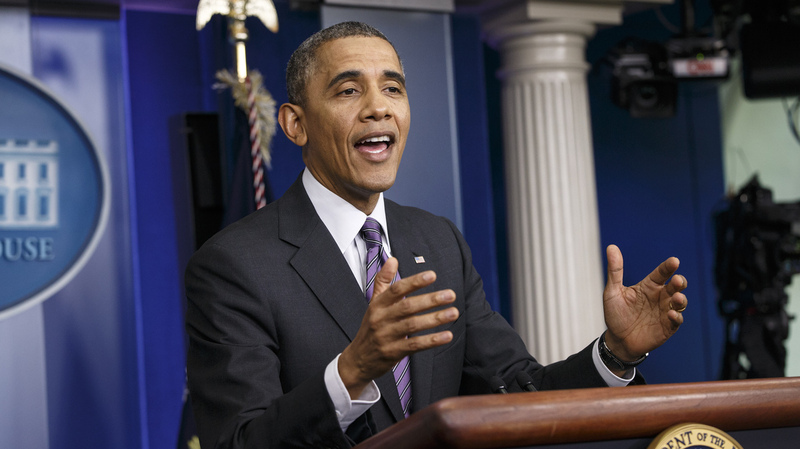 President Obama said eight million people signed up for health coverage through new insurance exchanges. Eight million people have signed up for subsidized private health insurance under the Affordable Care Act, President Obama said this month. Millions more obtained new coverage through the Medicaid program for the poor. Full implementation of the health law has renewed discussions of winners and losers, makers and moochers. Here's a corrective to common misconceptions about who pays for health care. 1) Before Obamacare we had a free-market health care system. Government has been part of the business of medicine at least since the 1940s, when Washington began appropriating billions of dollars to build private and government hospitals. The drug industry and its customers owe much to federally funded research. Of course Medicare for seniors and Medicaid for the poor, which both began in the 1960s, represent direct government transfers from some taxpayers to others. States have set rules for health insurance for decades. If you're insured through an employer that files an income-tax return, your coverage is heavily subsidized by the feds. Tax deductions for private medical coverage cost the U.S. Treasury $250 billion a year. Some would argue that private health insurance is own kind of subsidy. What the healthy pay in premiums finances care for the sick. Few patients except foreign potentates have paid their own medical bills for a long time. 2) I fully paid for Medicare through taxes deducted from my salary. Scholars at the Urban Institute have calculated that the typical Medicare beneficiary who retired in 2010 will cost the system more than twice as much in health costs than she and her employer paid in Medicare taxes. 3) Premiums from my paycheck fund my company health plan. For family coverage, which cost an average of $16,351 last year, the average worker paid only 29 percent of the premium. For individual coverage, workers paid only 18 percent of the (lower) total cost. Although premiums and out-of-pocket costs have been soaring for consumers, costs have been rising for employers, too — up by nearly 80 percent in a decade. Business spends more than half a trillion dollars annually on employee health care. 4) Government and employers pay for almost all health care. The household portion of the health-spending pie shrank from 37 percent in 1987 to 28 percent in 2012. But it's still larger than the federal government's 26 percent share or business's 21 percent. 5) The insurance company is always the bad guy. Human resources departments often trash-talk the company's insurance plan when telling employees the network of doctors shrank, the deductible rose or certain procedures aren't covered. But more than half of all workers with health coverage are enrolled in so-called self-insured plans where the employer pays medical bills directly. The insurance company only processes claims.